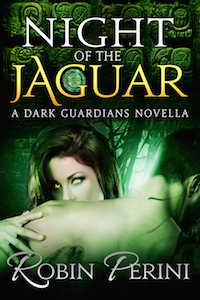 In the mystical jungles of Belize , home of the ancient Maya, tracker Caleb Pierce embraces his destiny as an elite member of the centuries-old Order of the Jaguar. His mission: to exterminate all vampires–those soulless, amoral beasts who prey on humans. Gifted with the ability to absorb a vampire’s power and wield it as his own against his prey, Caleb has become the Order’s most successful soldier while waging his private war for revenge against the beings who murdered his brother. He refuses to acknowledge, that with each battle, he and the other Jaguars become darker, more vicious…more like those they hunt. Aiyana believed the Order of the Jaguar to be extinct, until a powerful warrior erupts from the jungle at the site of the devastating massacre she failed to prevent. Since becoming a vampire, she has vowed to resist the lure of human blood, so as not to activate the soul-destroying virus that has infected her kind. Instead, she protects the innocent. Now, her sworn enemy has tracked her to her sanctuary where a forbidden attraction flares and tempts her beyond endurance. Will their passion lead them to destruction or will their defiant love fulfill an ancient Mayan prophecy and usher in the promised era of peace. Find out more!